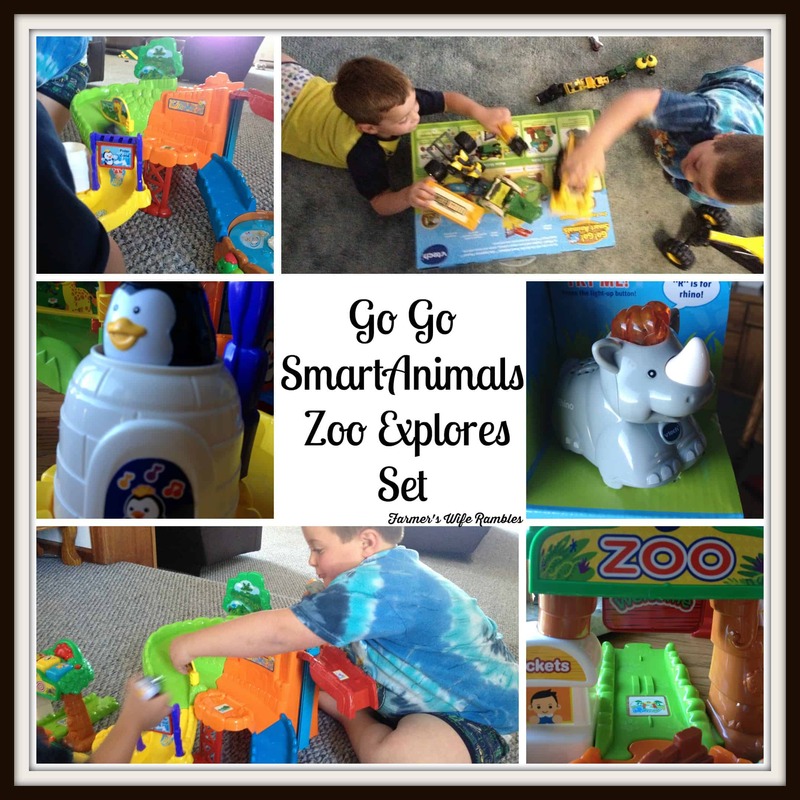 I received a Go Go Smart Animals Zoo Explorers Set from Vtech in exchange for my review. I enjoy toys that encompass learning with them. When the boys were younger this was easier to do thanks to companies like Vtech. It’s hard to find a toy for babies and toddlers that isn’t wrapped around learning and I am ok with that. When Vtech contacted me asking if I wanted to review the Go Go Smart Animals Zoo Explorers Set set I was super excited. Yes my boys are getting older but I think they might be a tad bit more sheltered as well. The Go Go Smart Animals Zoo Explorers Set set has an age range of 1-5 but my 6 year old can’t get enough of it either. It’s animals, trains and learning all in one! We owned a similar set when the boys were young and they played with it constantly. I was happy to find one similar that doesn’t have quite the pieces our old one did. Yes you can buy additional pieces for the Go Go Smart Animals Zoo Explorers Set which means that this is a set that will grow with you child but I don’t have to have 26 animals, 5 train cars and several track pieces just to start playing with it. Your child can learn about zoo animals through songs and fun phrases with the VTech Go! Go! Smart Animals Zoo Explorers Playset, which features a SmartPoint Rhino that interacts with seven different locations throughout the zoo. The electronic zoo entrance plays fun music and encourages your little one’s imagination. Your little zookeeper will have fun playing with the sliding elevator, spinning water tank and turning gate while also developing fine motor skills. 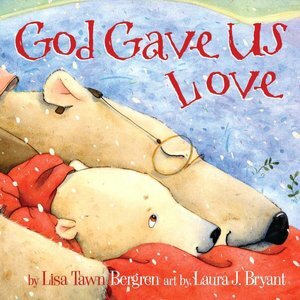 The phrases and songs help encourage first words. Word of caution before I begin… INSTALL BATTERIES AND STICKERS BEFORE YOU PUT TOGETHER! We waited and regretted it! My boys loved listening to the 80+ songs and I enjoyed the variety. When a toy only plays one song momma can go a bit bonkers listening to it over and over…you all know what I am talking about! For young ones it teaches music, animals, colors and pretend play. All these skills are important to prepare them for future schooling and adulthood. Learning with toys sure beats sitting in a desk all day being drilled. If your child can have these skills down pat before they head into preschool they will be above the curve (sadly) and on their way to starting their education off on solid ground. The Go Go Smart Animals Zoo Explorers Set provided plenty of entertainment. I must admit I was a bit surprised about this aspect. I surely though that my boys would grow tired of it quickly as they deemed it a baby toy. I was able to get over an hour out of it with them driving the trucks over the box as a ramp. After they tired of that and I couldn’t stand hearing can we open it anymore I let them open it up. Upon opening I was pleasantly surprised by the next hour of listening to them play and use their imagination together. They enjoyed putting together the track and I was able to get a lot of work done. I figured this would surely end though as the newness wore off. I have been mistaken so far. Corbin has come home from preschool everyday wanting to play with it before lunch time and it’s the first thing he wants his brother to play with him when he gets home. The Go Go Smart Animals Zoo Explorers Set will be on my list of gifts this year to give. I have a few little ones that will love this toy in time and I’m happy to be spending my money on something that will grow with them. Purchase the VTech Go! Go! 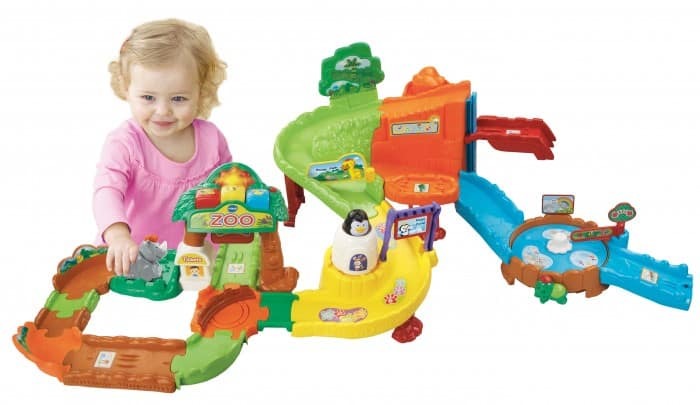 Smart Animals Zoo Explores Set at various retailers or you can find it on Amazon or Vtech starting at $39.99. For more information on the VTech Go! Go! Smart Animals Zoo Explorers Playset visit the Go! Go! Smart Animals page. You can also visit the VTech Facebook page and follow VTech on Twitter. One lucky Farmer’s Wife Rambles reader will win their own Go Go Smart Animals Zoo Explores Set. Just in time for Christmas!! Enter on the rafflcopter form below for valid entries. My nephew would love this playset!! Animals and trains are his favorites and he will be 3 in October!! THIS SOUNDS AND LOOKS SUPPER FOR EVEN ADULTS WHO LOVE TO BE CHILDREN TOO..